Beach Access, Pool, Wash/dryer, Parking, Internet, BBQ | $95 Night! Immaculate cottage with pool on beachfront property. Located on a large oceanfront property this charming studio is newly remodeled. 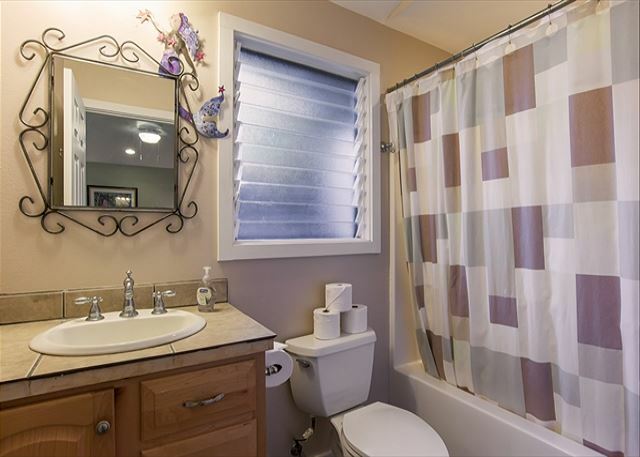 Full bath with bathtub, a well-stocked kitchen and a private courtyard make this feel like a much larger, private space. Parking and internet included. Private washer and dryer at unit. This home also has access to a large gated pool area, which is shared amongst the Banyan Estate and the house next door. The water in front of the home is shallow and calm, which is good for children. Surfing is possible during the summer months in front of the home if you walk out past the reef where it gets deeper. Amazing snorkeling is just a few minutes up the road at world famous Hanauma Bay. No hot tub on property. We were looking for a place for our bridal party and some of my family (bride here). We found this "Wedding Village" for our week, and it fit perfectly. The family stayed in the smaller houses. (One across from the pool, two next to each other near parking) and the wedding party stayed in the big house. Overall everything was perfect. The main living space was very toasty during certain times of the day, like other reviews stated. Just be sure to lock up before the heat of the day. They provided towels and beach towels, but bring your own soaps and shampoos. The ocean is very shallow for a long ways out, little waves because of coral and the water is a bit dusty. Bring some water shoes to play out there. The pool is pretty cold since it covered with big shady trees for most of the day. It's a great place to cool down, but a bit too cold for night swimming. It was such a fun place to stay. The house next door with the red roof is also for rent through the same company. I had cousins staying over there so it was an even bigger party. Be advised if you plan on hosting any piece of the wedding you will have to pay fees for it, but it's a nice place so you may want to if you have a small wedding. It's a great location, pretty easy to get to, and your own little beach side hangout that is big enough for everyone. It was perfect for our big group and was so much fun to get to stay together! Thanks Hawaii Beach Homes! The facility worked well for a large group of 24 including 7 children. had a few small problems with leaking sink drain and no sink stopper. The pool beach and large meeting area worked well. We had all 4 buildings on the property. Amazing house, with a beautiful lay out, there was so much to do in the area. Everything worked out perfect! We will be back! We had such a wonderful experience in our vacation rental, and we will come back. We have rented this studio for several years. 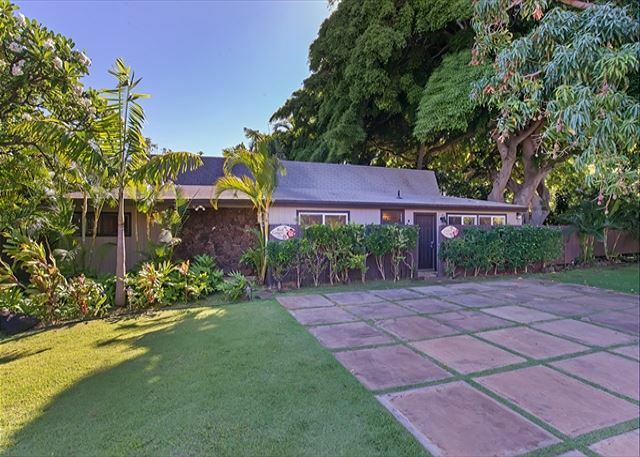 We like that it has a security gate, beach access, is conveniently located in a quiet area, yet close to the highway for visiting all that Waikiki has to offer. Foodland, Costco and wonderful restaurants are close if you choose not to cook. Otherwise I find the kitchen very workable with a full size stove, refrigerator and microwave. We needed an item and Hawaii Beach Homes staff quickly delivered it. We've never been disappointed with this rental. We slept so very well at Red Ginger. The bed was perfect for a good nights sleep, very quiet and comfortable. The lovely Hawaiian plants surrounded the studio and we had coffee on the lanai in the morning. A perfect stay. Thank you. Beautiful!! Better than the pictures! We rented all four homes on this property for guests for our destination wedding and we had an amazing time! Everything in all four houses was clean and comfortable, and the backyard beach and pool surrounded by tropical plants were stunning. Our guests all had such a great time it was tough to leave! We loved it! Hosts were very hospitable and accomodating. Clear communication throughout the entire booking process and during our stay. We had no issues from the start and the whole thing was pretty seamless with over 17 people flying in from out of state. Had a great time house was amazing thanks very much! It was that good we'll be back again next year. Manager Response: Great ! We will be glad to have you back again.